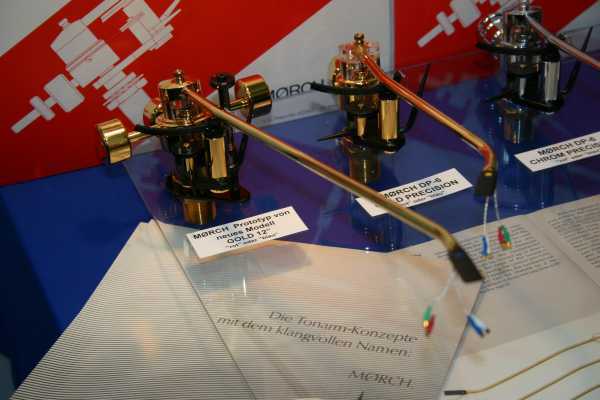 H.H.Moerch of Moerch tonearms from Denmark presented the new double pivot tonearm with double side weights. 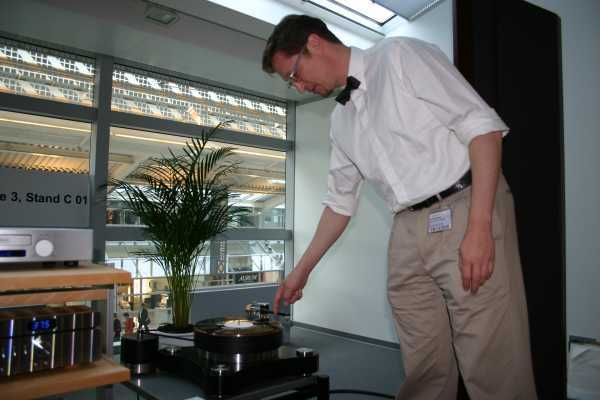 Micha Huber of Thales tonearms from Switzerland presented the Thales tonearm, which has a quite complex construction for eliminating the horizontal tracking error. 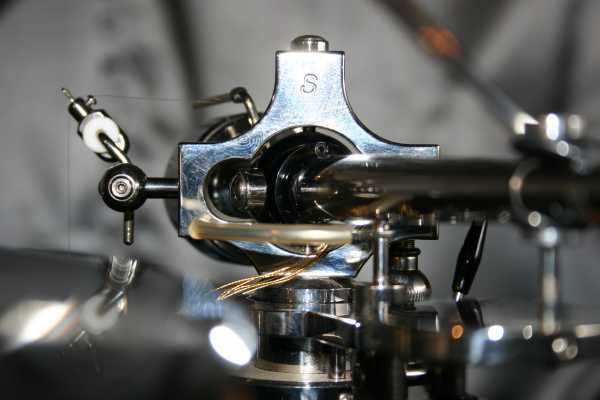 The Thales tonearm was mounted on a Brinkmann turntable. 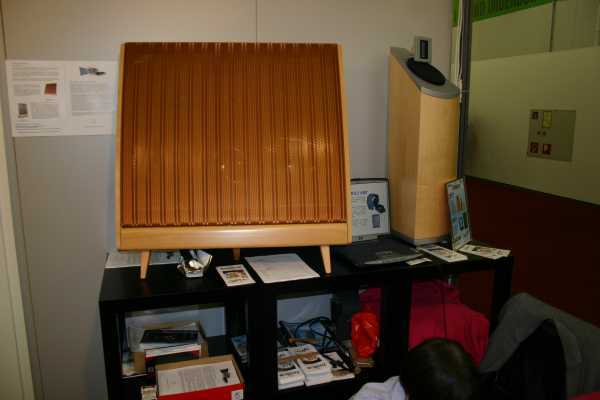 Manfred Stein of Quad Music Germany now is the one you need if you want to overhaul your old Quad ESL57 or ESL63 loudspeaker, because he owns the workshop stuff for the rebuild. 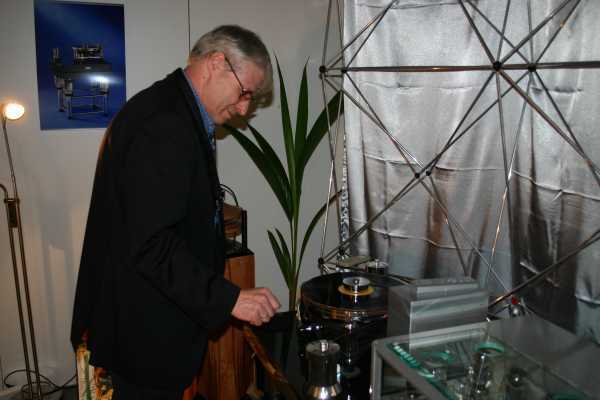 Eddie Driessen of Pluto Audio had his Pluto 10A turntable with 9A tonearm playing. 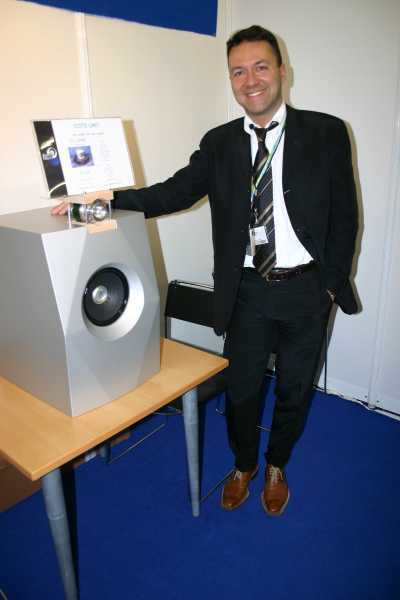 Fabio Camorani of Audio Nemesis had brought his loudspeaker made from GOTO drivers to Munich, but only one, and only for display. Fabio, please, bring to us a pair of speakers and some music next year. 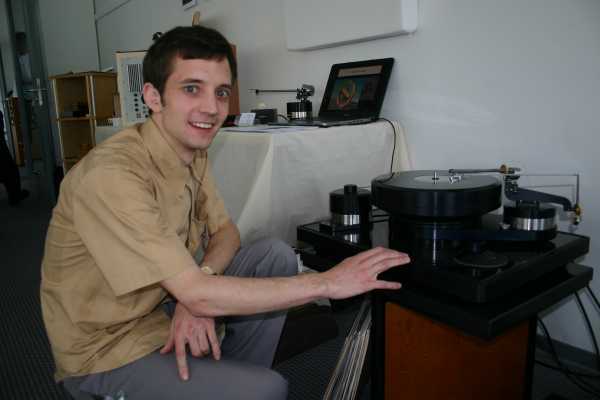 Frank Schroeder of Schroeder tonearms needs no introduction. 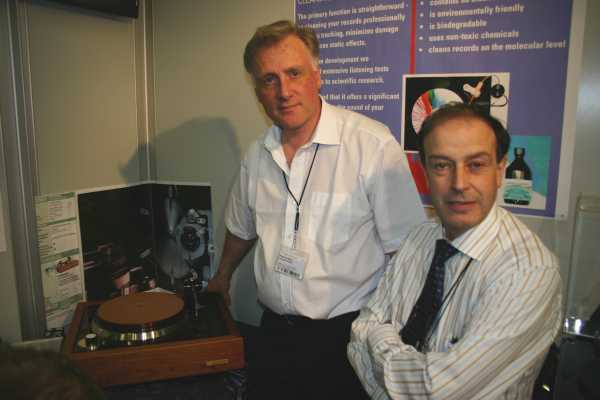 He started making tonearms 20 years ago, and four years ago, suddenly, the audio world took notice of him. 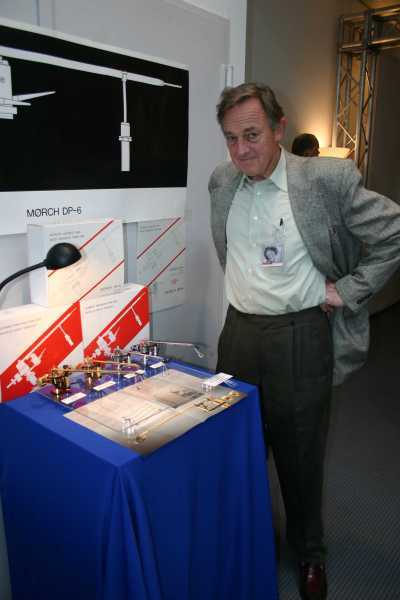 His tonearms were present at many places all over the show. 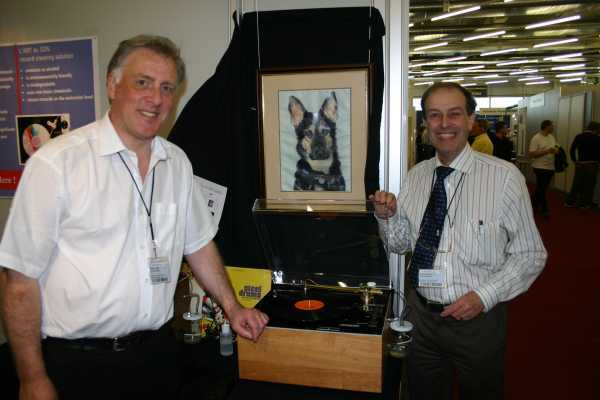 The Loricraft Uk based staff consisted of Nigel Pearson (left), Terry O'Sullivan (right) and Cindy O'Sullivan (the dog). Terry and Nigel tried to persuade me to believe a really weired story about Cindy, in a really Mr.Bean style. 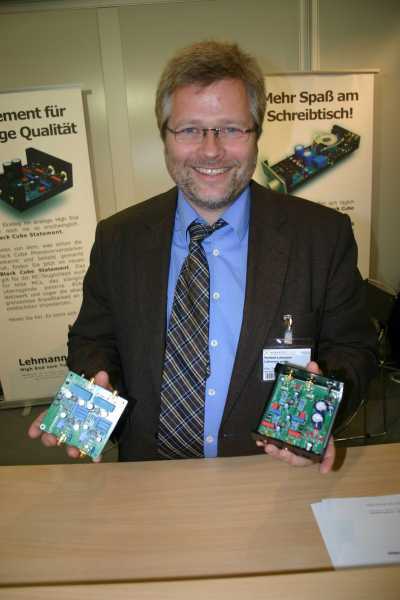 Norbert Lehmann of Lehmann Audio presented the new improved two successor models Black Cube Statement in his left hand and the new Black Cube (SE) in his right hand. 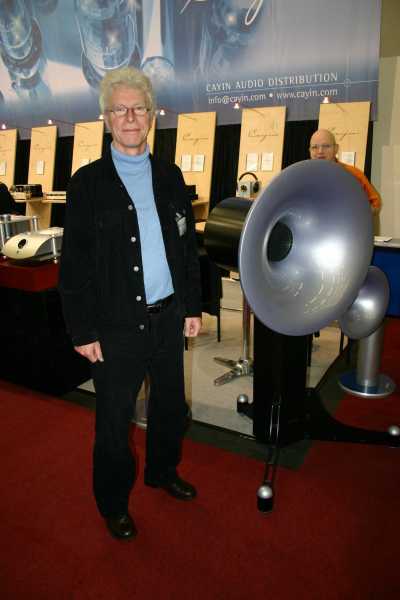 Heiner Basil Martion of Martion Speakers, who got my vote for last year's best sound, had his speakers playing at the tube power amp shootout of the German magazine "Stereoplay".